"This Coretta Scott King Award-winning book is a visual treat in print form. Now it's an auditory one, as well. Each poem in this diverse collection celebrates the unique position that fathers hold in the eyes of their children. The poems shine the spotlight on fathers who have toiled on the farm, tickled delighted children, reprimanded with love, savored a quiet embrace, and fished or shot baskets. Each poem is distinctively framed. While the book does this through illustration, the recording does this through the varied narrators and specific music (or silence) that accompany each poem. The vitality and message of each resonate." 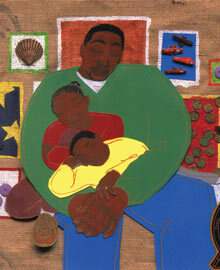 "This picture book featuring short poems about fathers is audibly incarnated by illustrator Javaka Steptoe, as well as Robin Miles, Lizanne Mitchell, and Charles Turner. The eclectic musical background nicely complements respective moods and includes a reggae accompaniment in "Tickle Tickle," hand clapping in "Her Daddy's Hands," and a plaintive saxophone melody in the melancholic "The Things in Black Men's Closets." These truly diverse "celebrations" of fatherhood are illustrated in Steptoe's amazingly varied collages. This poetry collection expresses the playfulness, wonder, honor, pride, and tenderness that Steptoe (the son of illustrator John Steptoe) and other artists realized in their fathers. This joy and poignancy are expressed in solo and ensemble recitations."